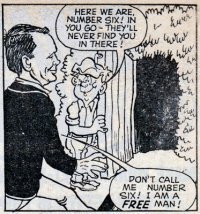 The name of Lew Stringer will be very familiar to fans of The Prisoner, not only as the man who founded and launched The Unmutual Website, but as a professional comic artist, who has reference The Prisoner many times in his strips in various comics and publications (his ROVER ONE strips can be seen HERE, for example). Fans will no doubt be pleased to hear that Lew runs an online blog, and a recent posting/article by him looks at a rare and early Patrick McGoohan / Number Six appearance - in the comic '"SMASH" (above). Click HERE to read Lew's blog. Above artwork copyright Lew Stringer from his character of Combat Colin. 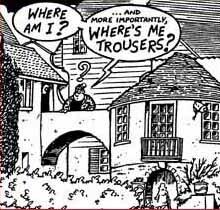 With thanks to Lew Stringer for this news item.